Now this is superb creativity! A cartoonist created a map that depicts social networking websites as countries with sizes that depend on how popular the sites are. 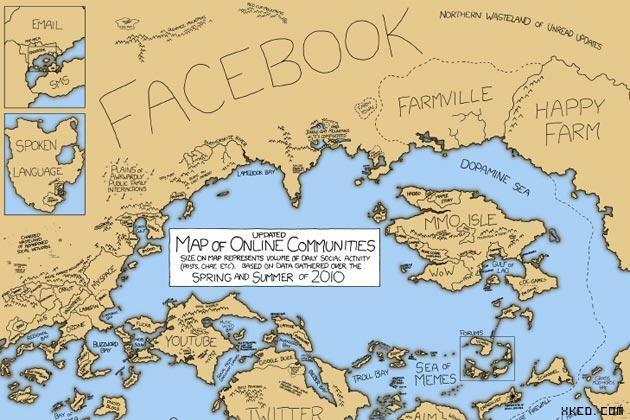 The cartoonist, Randall Munroe, is a graduate student from Massachusetts, has drawn up a world map that represents the levels of social activity in each community such as Facebook, Twitter and many others including Farmville! Munroe was last known as the creator of the cult webcomic xkcd. The map shows each country named after a website and the more popular sites have bigger masses. The map was drawn based on statistical information including website hits and number of members in each community. This is in fact a second version and a previous version was created back in 2007. Facebook, Twitter and Skype dominate the map along with Email. Myspace however was much smaller than anticipated. Farmville had quite a nice chunk from Facebook while Youtube was a good sized island. RockMelt – The new Social Browser! Yeah so do I! but i wonder if it was to easy..
Hey great site and thanks for the link to it.